Louis Tomlinson Web | Louis-Tomlinson.org – Page 22 – Your source for Louis Tomlinson! Louis & crowd sings Zayn’s part in “What Makes You Beautiful”! Posted on Mar 3, 2012 Mar 3, 2012 Author admin Categories Performances, Video No Comments on Louis & crowd sings Zayn’s part in “What Makes You Beautiful”! While Zayn is back home after a close family member died, the boys still have shows to do, so the boys split up Zayn’s parts in the songs. Louis sang Zayn’s part in “What Makes You Beautiful”, but then he turned it over to the crowd! How cute! Check out the video below. Credit to OneDirectionOnline.com for the video. Is there a One Direction movie in the works? Posted on Mar 3, 2012 Mar 3, 2012 Author admin Categories Movies, News No Comments on Is there a One Direction movie in the works? Awesome news, Directioners! One Direction are already pretty big, and now they may get even bigger — say, 30 feet tall. Rumor has it a One Direction movie may be happening! Reports say that the band was in talks with Simon Cowell about a television show, but that a full-blown film may happen instead. Harry Styles said they’ve even had some pitches already. “We have had a few offers,” Styles revealed. “We like the idea of a documentary-style one.” So do we! The adorable Brits will perform at this month’s Nickelodeon Kids’ Choice Awards. They’re currently on tour with Big Time Rush and enjoying the Directioner mania that comes with their appearances. 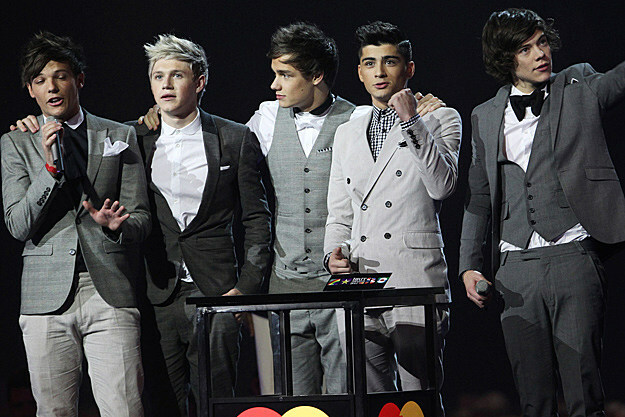 ‘What Makes You Beautiful’ recently captured the prestigious Best British Single title at the 2012 BRIT Awards, and it debuted at No. 28 in its first week of U.S. release, the highest charting debut by a U.K. artist on the Hot 100 in 14 years. The group will also appear on an episode of ‘iCarly‘ later this year in both performance and acting segments. This sounds like such an awesome idea! I think a documentary would be cool to see! Also rumors saying that they may get their own show on Nickelodeon. I think a movie would be better as it’s not so time-committing for the boys with already such a big schedule they have.